Electronic platform weigh scales are widely used in manufacturing, technology, and agricultural settings. The varied use creates a need for customized solutions. Obviously, a clear/well-defined need leads to a specific solution. As a rule, all weighing scales should be accurate (or any equipment for that matter designed for quality assurance should conform to ASTM or other relevant international standards) for accuracy and error tolerances. They should be calibrated before they leave the manufacturer’s premises. After delivery to the client, to ensure that in-transit handling did not adversely affect the calibration settings, they should be rechecked and if need be recalibrated again on site. Annual calibrations will ensure accurate weighing results in the long term. This is to ensure compliance with government regulatory bodies’ requirements on product standards for consumer/customer protection. For example, a pound of milk bottled or tetra-packed a million times should always weigh, for instance, a pound per bottle and within allowed error tolerance of plus or minus 0.1 oz. Major applications of electronic platform scales are in manufacturing, technology and agriculture. In manufacturing – from bagged cement to packed cereals, from frozen meats and livestock to canned goods, all the products need to be weighed accurately with consistent results. In agriculture, many applications come to mind. First is weighing agricultural products like grains before and after drying to determine weight-moisture loss. Second is determination of correct proportions of feed nutrients given to livestock. Third is weighing packed finished goods prior to delivery to various consumer destinations. In technology, the need would be in computerized, pre-set weighing applications. For portable weighing applications, provisions for AC/DC use are a must. New models are available wherein the weighing platform is connected to the outlet by at least a five-foot electrical wire for user safety and convenience. This way, both user and the weighing readout portal are protected from harm in case of misjudgment on the part of the user. 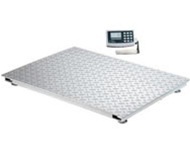 For a variety of electronic platform scales be sure to visit Arlyn Scales at www.arlynscales.com today!